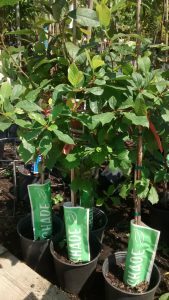 The Oak Leaf | If you haven't been to Oakland Nurseries, You simply haven't been to a nursery! 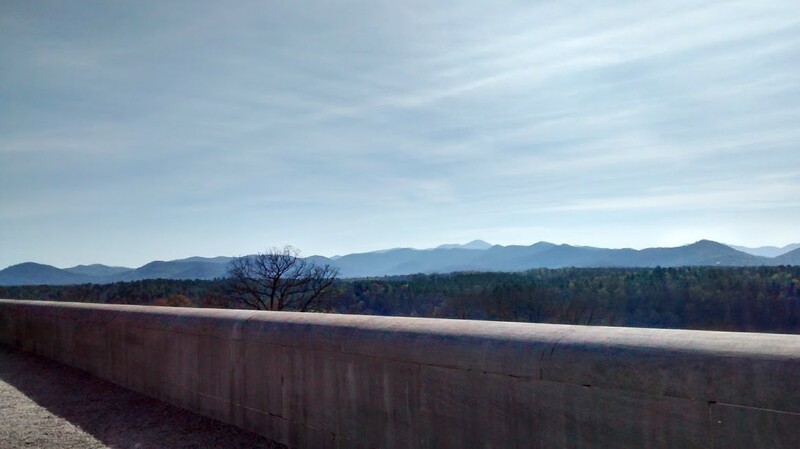 I was fortunate enough to visit The Biltmore Estate last year- it was my first Spring visit. I had been a horticultural intern a few years back (okay fine more like a decade ago), but it was during the summer months. And even having visited grandparents yearly, during my childhood who lived in the area, somehow never managed a spring visit. 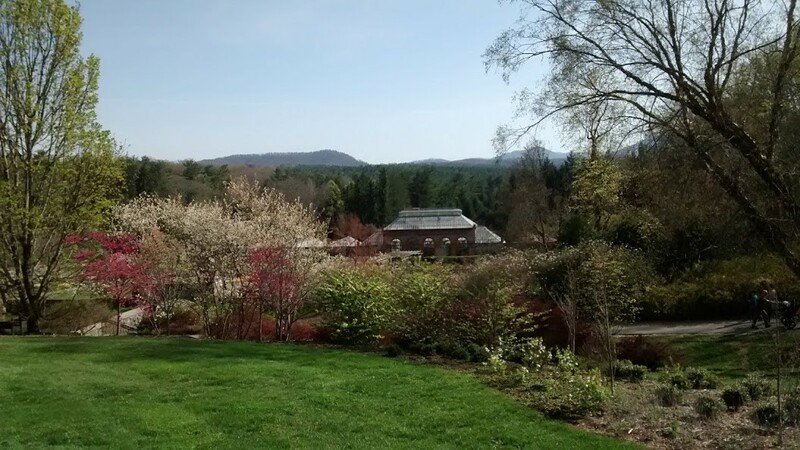 Visiting the Biltmore Estate in the spring is a big deal, because within the acres of this awesome historical landscape, there are two gardens that are relevant and aptly named: Spring and Azelea Gardens. 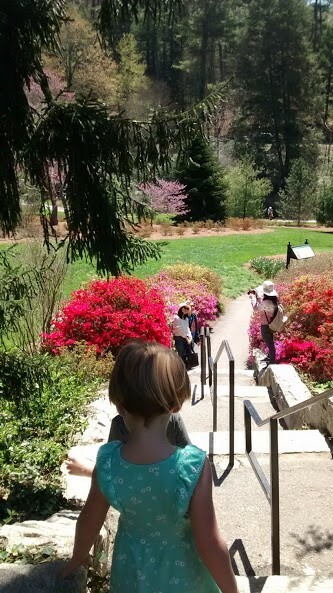 The Spring Garden is chalk full of spring blooming beauties. 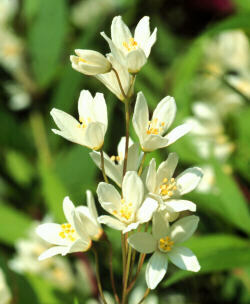 Here are some that also grow well in central Ohio: Beautybush, Forsythia, Deutzia, and Mock Orange. 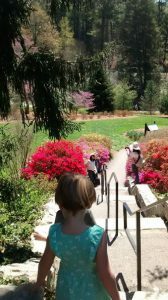 The Azelea Garden is much larger and contains Chauncey Beatle’s azalea collection. In addition to being a devoted horticultural collector Chauncey Beatle also served as the estate’s long time superintendent. 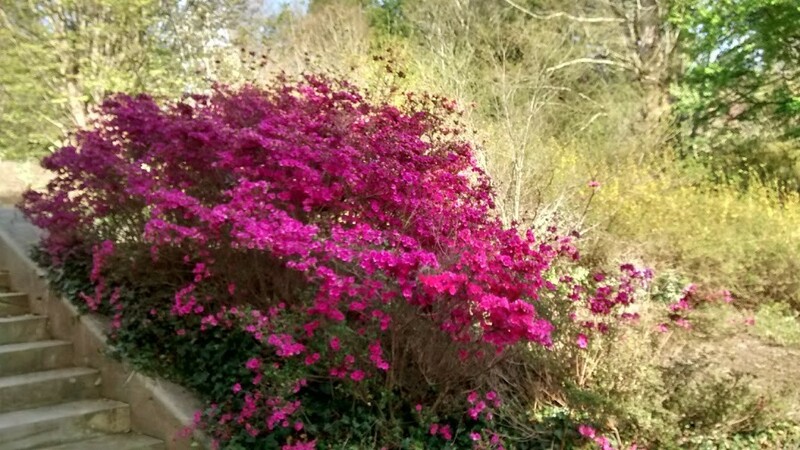 It was rumored that there are at least 50 different varieties of azaleas. I’m sure someone there has taken the time to count, I however, never did. I was too in awe of the enchanted happenings in the garden. 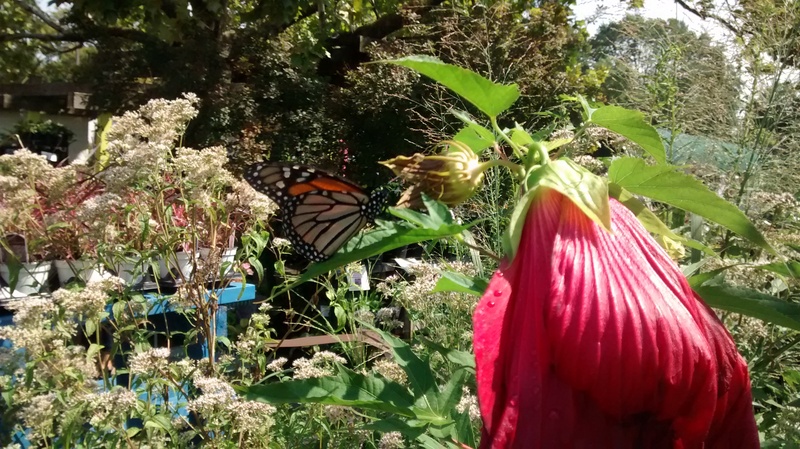 There secrets to this garden’s successes are in the soil. 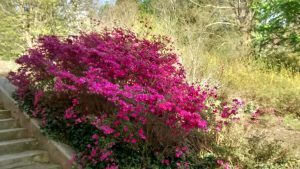 Azaleas, Rodos, Hydrangeas all thrive in acidic soil. Much less known and under used plants with a spring punch are Mountain Laurals, Peiris and Daphine that also thrive in acidic soils. Here in central Ohio we have dense clay alkaline soils. Nevertheless, we can still grow these beauties here with a little extra TLC. Another thing all these plants have in common is the need for part-shade. 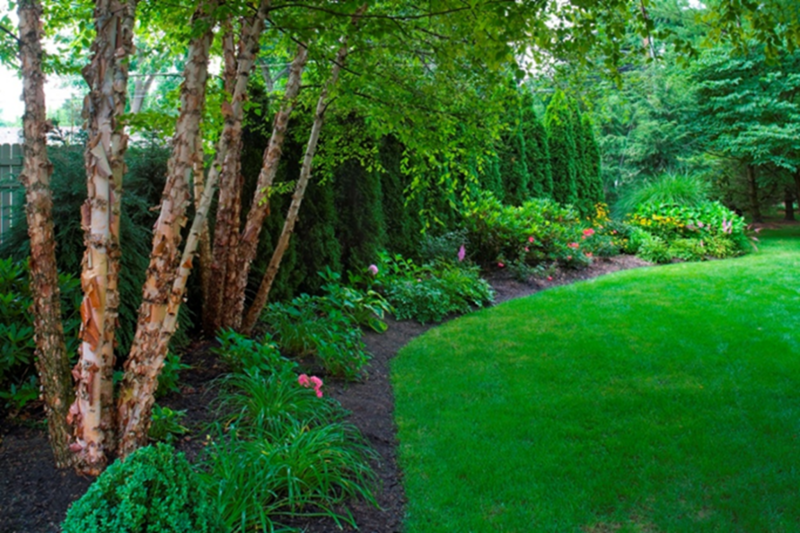 Ideally, a spot in your garden that has some morning light and afternoon shade. 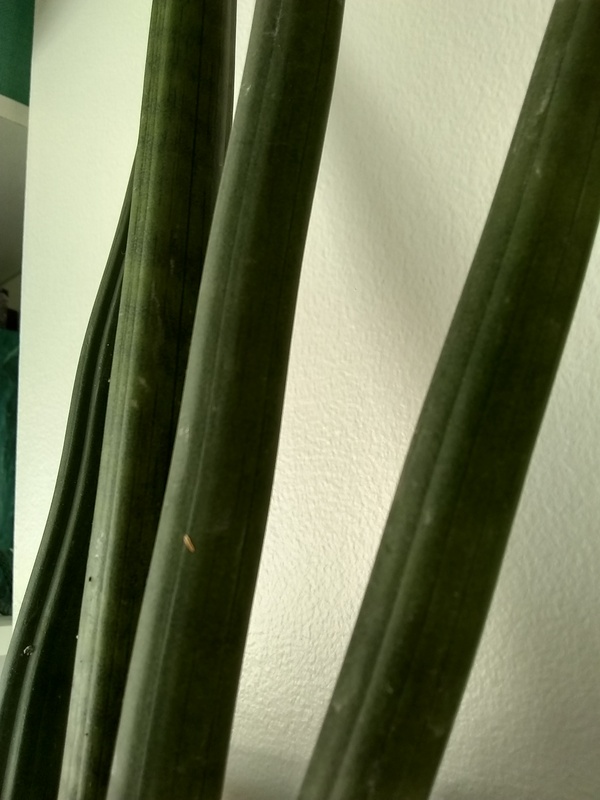 These plants are all naturally under-story plants and therefore need some protection from the sun. Dappled sunlight throughout the day under a shade tree would also work well. 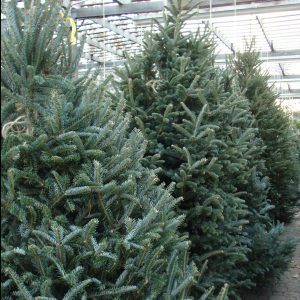 Even better yet – if you have some mature pines or spruces- filling in around the base with any number of these spring show-offs would really add some interest. And you can take advantage of the natural pine needle mulch! 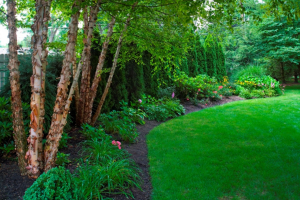 After finding the perfect shady location, it’s important to remember to plant amending the soil with compost AND a fertilizer that will add acidity to your soil. I’ve always favored, Espoma’s Holly-tone. It’s an organic granular soil acidifier that you mix in the soil when planting and twice a year at the base of the plant (spring and fall). 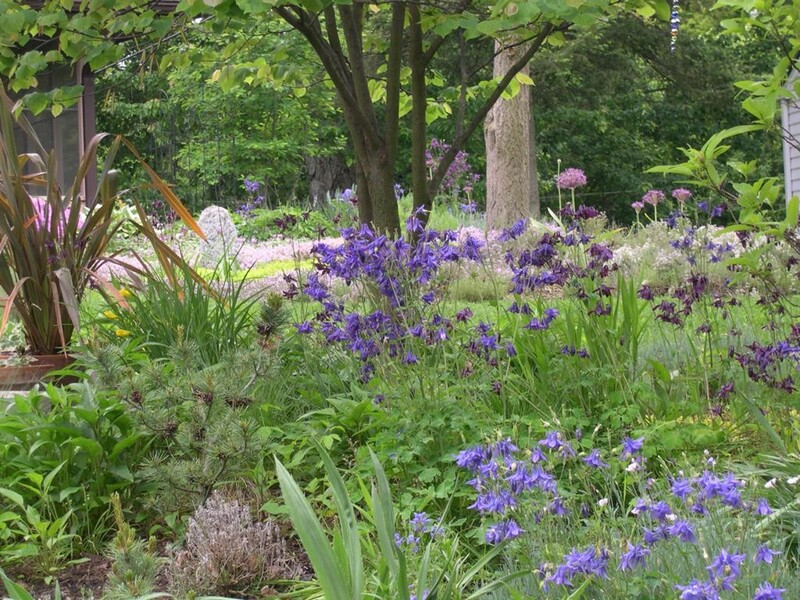 It’s not just for Hollies – it’s for all the acid loving plants – which there tend to be quite a lot of! 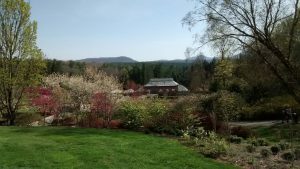 Off the top of my head…..Azaleas, Rodos, Hydrangeas, Mountain Laurals, Peiris, Daphine, Hollies, Winterberry, Umbrella Pine – and this time of year, I even throw a little at the base of my Japanese Maples as well. Have fun trying something new! Happy Gardening! It’s time to seize the mulch! Maybe you’ve been feeling behind because you haven’t gotten to mulching your garden beds yet? (You know, because of the recent snow we’ve had within the first few days of spring?!) Welp, I have great news. Mid-May is the ideal time for putting down your mulch! Take full advantage of early spring mulch sales, but just wait to actually put it down. Here’s why. Soil temperatures: It isn’t until mid-May that the soil levels has warmed to about 55˚. It’s this 55˚ mark we’re aiming for, so that our roots can grow and thrive. 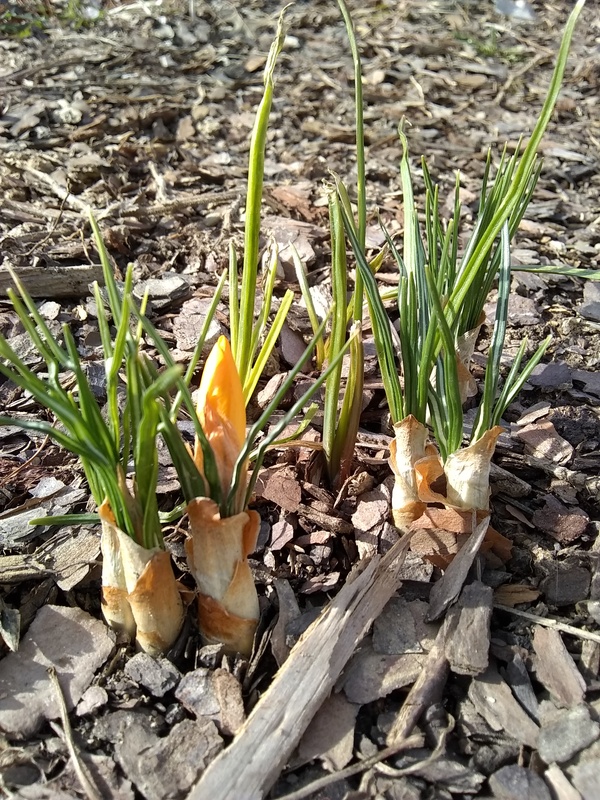 55˚ is warm enough to put that mulch down and the mulch will help keep the soil temperatures more temperate (instead of spiking during the day and dipping low during the night.) Mulch will also help insulate the soil and keep it from getting hot during the summer. Moisture: that’s right. Mulch will help keep all this spring rain we’ve been receiving in your soil. Mulch acts as a barrier and slows moisture from evaporating from the surface of the soil. HOWEVER (yes, this is a literally and figuratively a big point) if mulch is put down too thick (more than 2”) than this mulch barrier will compact and restrict air flow, as well as becoming water impermeable a.k.a. water proof. If you put mulch down too thick, your mulch will act as a barrier to water, not letting it seep into the soil, but rather, run off. This is bad. Really bad. One definitely does not want WATER IMPERMEABLE SOIL. Those plants, whether newly planted or well established need that rain water just to survive, let alone thrive! More reasons not to mulch over 2” thick: 1. Another great reason not to put your much down any more than 2” thick, weeds will grow in your mulch. 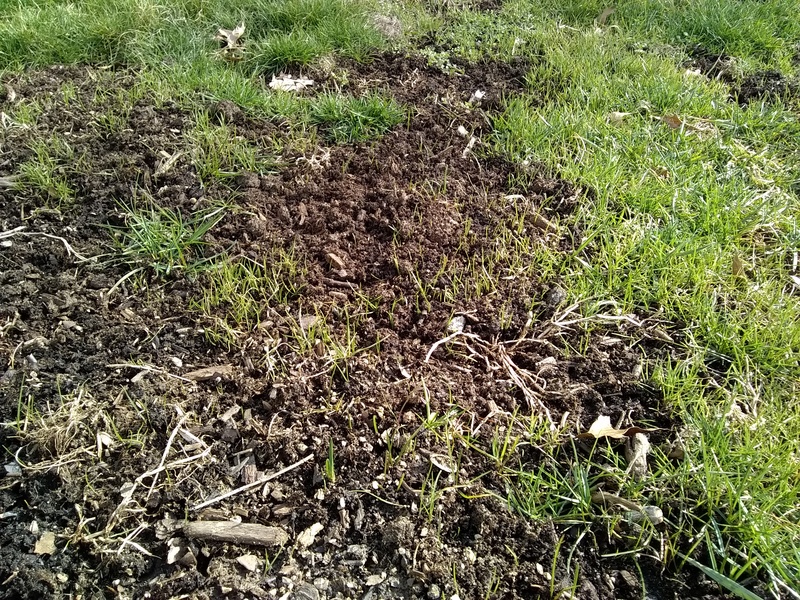 I often hear the argument that “I put mulch down to help keep the weeds down.” This statement can easily be misunderstood and I feel the need to break it down. Mulch can “keep weeds down” in the sense that it will shade out weed seeds in your soil. If you think more mulch the better, I’m sorry to be the bearer of bad news – you happen to be wrong in this case. Weed seeds will grow in the mulch just to spite you. Harsh I know, sorry Dad. 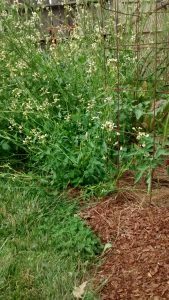 What about perennial weeds? Established perennial weeds are capable of growing through a 2” thick mulch barrier, sure. But also 3” or more as well – think dandelion and the loathed thistle. And by putting more mulch down to suffocate established weeds, you’ll not only have weeds growing through your mulch, but in your mulch to boot! 2. Thick mulch will also create undesirable soil conditions because the plants you’d like to see thriving aren’t receiving enough water AND you’ll be lucky enough to wittiness dog barf fungus. That’s right folks, there is a fungus commonly called dog barf. Any guesses why? This fungus is a tell-tale sign your soil is not receiving enough air circulation. The solution, clear away the mulch. You may need to use a shovel or pitch fork to pierce threw the mulch- it will be pretty compacted. Okay, so now you know the ideal time to put mulch down, but what kind? There are so many many options. And it does matter what type of landscape you have or intend to have. Black (triple forever and eternity) This provides great contrast in color in the garden, especially along the front at the bed lines. No matter how well marketed, it will fade in color – eventually. But before it does, depending on the brand, the black dye will dye everything it touches, clothing, hands and usually most upsettingly driveways and walkways. It’s a great mulch to get that clean crisp formal look, unfortunately, not the easiest if you’re the one handling it. With a good hard spring rain, the dye does wash off of hard surfaces. Brown hardwood – see above rant. Okay, that’s a little harsh…Oakland does have a really nice brown hardwood mulch, that is processed enough that you’re left with a fine texture and rich (more natural looking) brown color. It also achieves a clean, crisp look at the front any garden bed. You can usually catch a good spring sale on the hardwood mulches to get even more for your dollar. Pine products (bark, nuggets, needles): Naturally dark brownish/red color. Contains no dye and is minimally processed. These types of mulch DO ADD to your soil profile and help to break up the dense clay because this mulch is considered organic matter! As this mulch starts to break down and decompose into your soil, it will add some acidity to your soil. This is great for us central Ohioans because our clay soils tend to be on the alkaline side of the pH scale. Who cares you say? Most ornamental trees and shrubs benefit from a little acid kick, but especially Hydrangeas, Azaleas, Rhododendrons, Mountains Laurels, Pieris, Hollies, Inkberries, Japanese Maples and Crape Myrtles. I also like to use this mulch around my perennials as well for similar reasons. Unfortunately, you’re paying for the added benefits, I general, pine products are going to be a little pricier than most hardwood mulches. 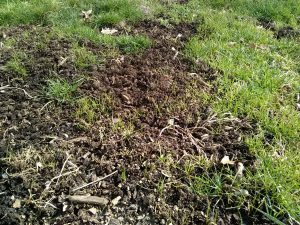 Leaf Mold/Compost – This mulch is ground up leaves that are slightly decomposed and therefore a nice rich dark brown color. This mulch is great in adding organic matter to your soil profile. Often you’ll see this product with added compost- which adds a little more nutrient bang for your buck. It also tends to be organic and therefore safe (and great!) around your vegetables and herbs. (psst..it is often the cheapest when you can find it in bulk). Okay, phew…congratulations! You’ve made it through the mulch soap box. And it was a big one. But one last thing- you don’t have to mulch every year! What???? Mind blowing, right? But I’m totally for real. 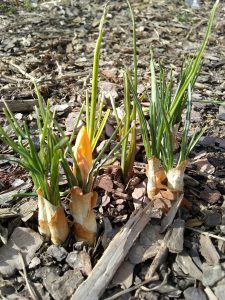 If you happened to have put on the mulch a little thick last year or its still 2” thick in areas, simply turn the mulch (grab a small pitch fork or pronged tool) and rough up or as experts say, “fluff” your mulch. And you’ll be all set. Seeing those little green tips peeking out of the ground inspires an onslaught of excitement. Who’s not ready to soak up some greatly missed sunshine, warmer temps and literally getting your hands dirty?! Because of the intensity of my general excitement for all things outside, it can quickly turn overwhelming. Take advantage of mulch sales – Go ahead a take advantage of these opportunities, but don’t worry about getting your mulch down and spread just yet. Give the soil some more time to warm up! 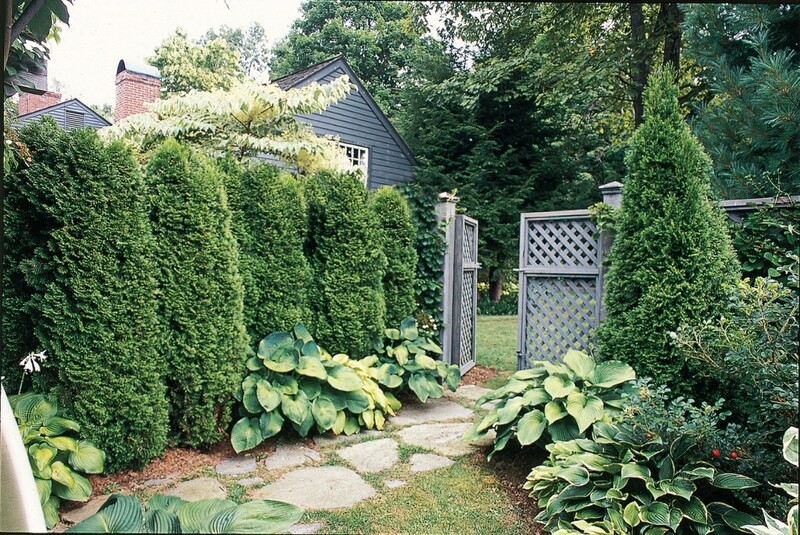 Clean out inner dead from arborvitae – this may seem rather specific, but it will help keep pests down and promote more vigorous spring new growth. It’s worth the time to list out all your garden thoughts and potential projects beforehand to avoid starting multiple projects and then never finishing and to simply be more efficient. We never have all the time we’d like to devote to our landscapes, but having set priorities, you’re more liking to accomplish them from start to finish. And get more done! 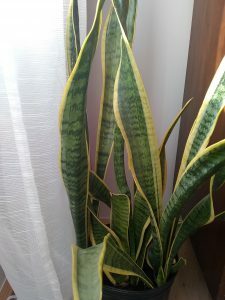 Snake plant, sometimes more interestingly referred to as Mother in law’s tongue, is a low-maintenance indoor plant. One of my favorites, because it can put up with a variety of situations and does not complain. 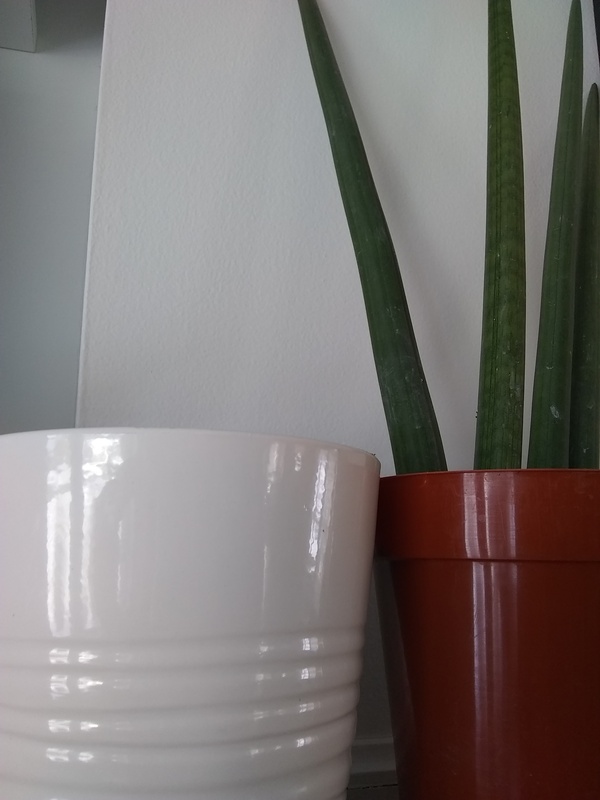 Snake plant is known to improve indoor air quality by absorbing airborne toxins. 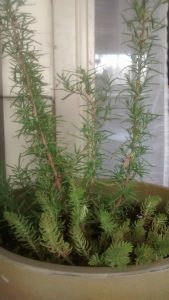 It’s a great plant to start with or if you already have a few indoor plants, it can be a great addition. 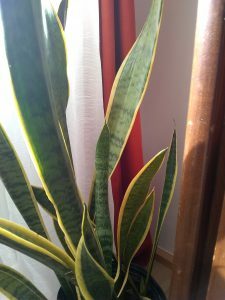 Snake plant can tolerate high light, low light to almost no light! I have one in our bedroom next to a window facing West and the neighboring house shades out any late afternoon sun. Plus, the blind is always left drawn, minimizing what little light it gets even more. 2. Snake plant likes to dry out between waterings. Meaning, check the soil and it should feel dry below the surface before watering again. The more light it receives the more water it will require. And the other way around, the less light it receives, the less water it will need. 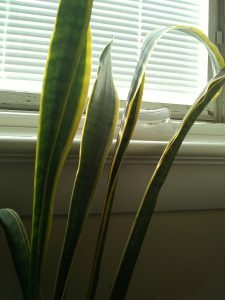 Where my cave-of-a-bedroom snake plant resides, I only need to water once every two weeks. In a more regular situation, it’s more likely to need water once a week. It’s also important to note that the pot it is planted in needs to have drain holes in the bottom. One drain hole is acceptable, but more is better in this scenario! I would recommend leaving it in the (cheap) plastic pot it comes in and use a more decorative pot as sleeve. The decorative sleeve does not need to have a drain hole, but it would be wise to make sure that the snake plant is never sitting in standing water, otherwise its roots will rot. It likes to be snug in its pot. So really, it prefers to be left in the pot is comes in even if it’s growing right up to the edge – no transplanting necessary. 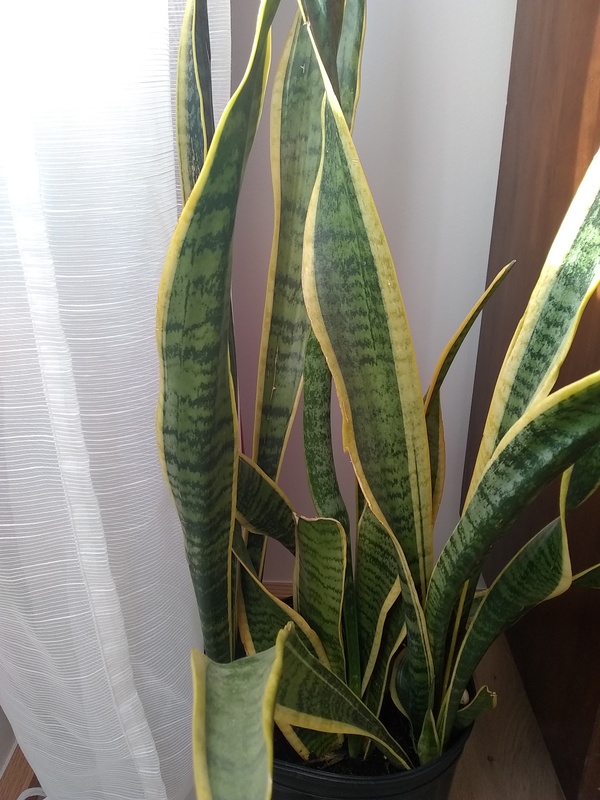 Despite the nickname, mother in-law’s tongue, it is a very forgiving plant. If you happen to forget to water it, it will be just fine until you do remember. And it isn’t unusually susceptible to any pests or diseases. This no drama plant should last you years to come. Click here for more “no drama” interior plants. We’ve been seeing some new and interesting varieties come through our greenhouse lately – Come in and take a look for yourself. Christmas tree season at Oakland Nursery is one of my favorite times of year. 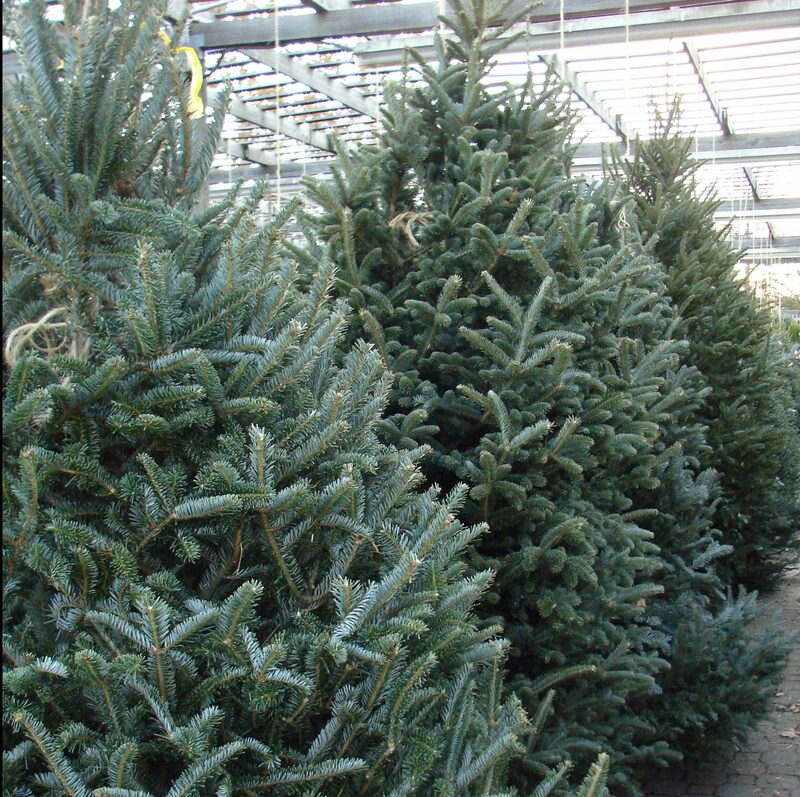 I love coming home smelling like Christmas after schlepping trees for customers. Everyone is in a good mood, enjoying (or enduring) the endless cheesy Christmas music! A favorite non-cheesy song of mine (and yet to ever be heard at one our locations…) is Simple Gifts. The lyrics of which I’m also constantly trying to abide by. ‘Tis the season for love, giving and warmth – but also for many, the season of being easily overwhelmed. As a self-proclaimed terrible gift giver, I tend towards the easily overwhelmed side of the holidays. Knowing this, I try to keep things simple. But in recent years things have gotten more complicated….not only is there pressure for a great thoughtful gift for my husband, but also his parents and siblings and their children, my parents – who already have everything – and a difficult brother. Then there is my children, who are both old enough and young enough to want everything, right now! I realize this is very quickly turning into a “woe is me”, first-world problem. But true simplicity has been gained… I thought of a great SIMPLE gift! And in the spirit of the giving season, I thought I’d share my first-ever good gift idea with you! Heat water in a sauce pan and add sugar. Stir in sugar until it has melted. Add flavoring. Take pan away from heat and let cool. Strain out any solids and bottle up. And refrigerate. Flavoring is where you can make things interesting. 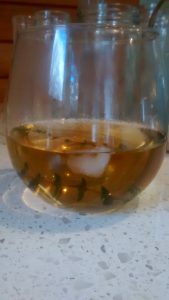 I like to make use of the remaining herbs left in the garden, usually thyme or rosemary. If you’re feeling experimental, try pine (a sprig of white pine to be exact). Or if you want to enhance the old gin and tonic, throw in a sprig of juniper. Basil or Lavender are also surprisingly good, but you’ll have to make a trip to the store for those. 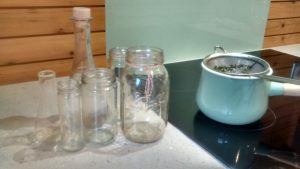 If you take the time to pour the syrup in small decorative bottles, you can easily turn this homemade simple gift into something to be treasured. These syrups can enhance a mixed drink or a cup of warm tea! Your friends and family will love it, and if they don’t, they’re just being impossible. And you can always blame me: the terrible gifter! You’re welcome. If you’re looking for some more gift ideas from the terrible gifter, check out these ideas! 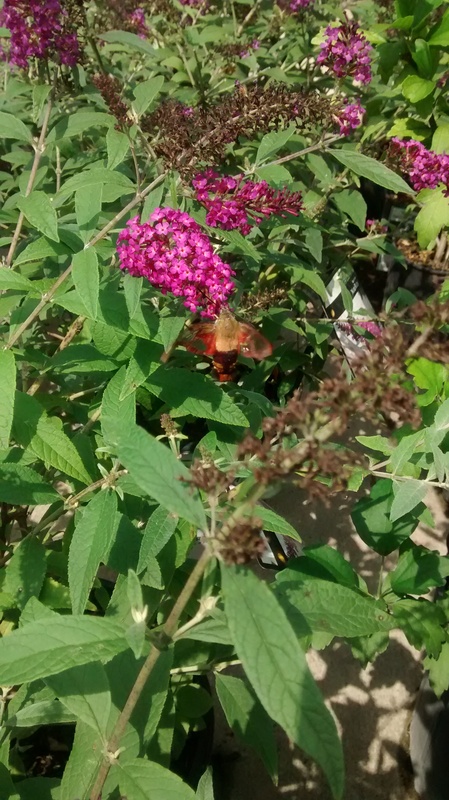 It’s that time of year when the nursery has a special buzz welcoming the Fall season. Things are hopping around here and it’s always a nice surprise to see these friendly and diverse faces. 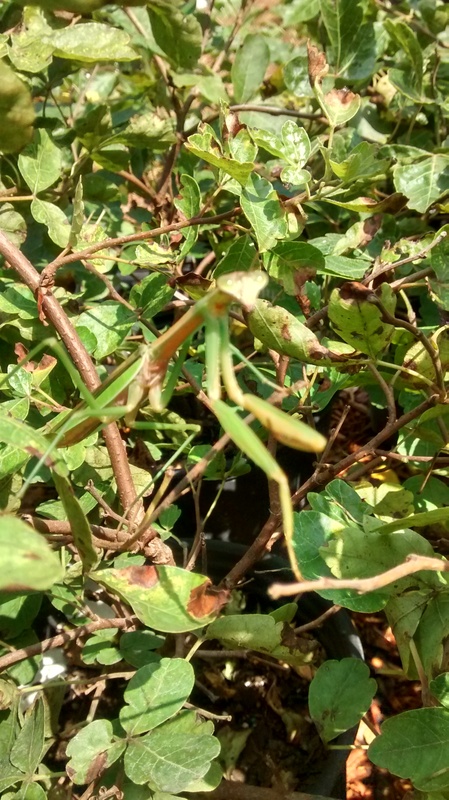 Here are few photos of the wildlife we find just around the nursery! The largest praying mantis I’ve ever seen and also the inspiration for this post! Seems like there have been quite a few monarchs around this year! Don’t tell my soon- to-be-entomologist son, but generally I don’t consider spiders friends. 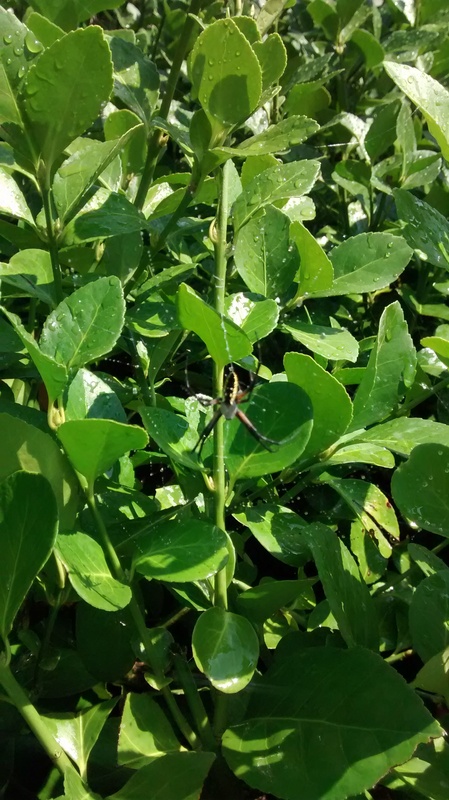 However, I can make an exception for this aptly named Garden Spider. 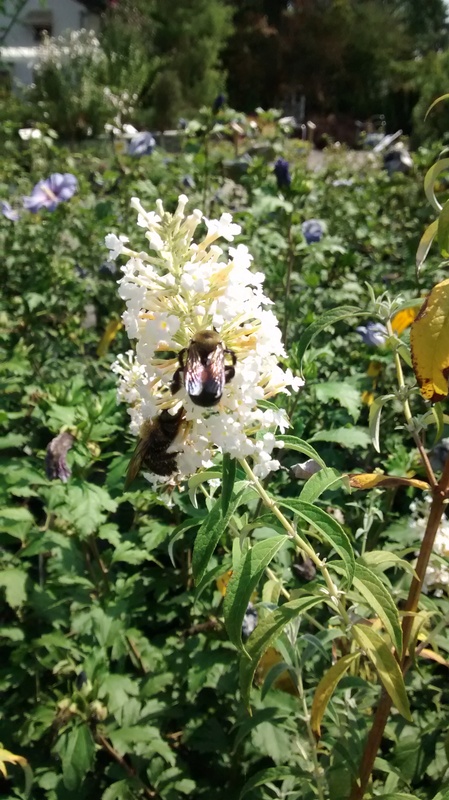 Bumble bees…There is a manger here at Oakland that actually pets bumble bees. Manger, bumble whisperer. Don’t worry, everyone gives these friends their space! Hummingbird moth enjoying a butterfly bush. This friend is super hard to snap a photo of, at least with my phone’s camera. Can you tell what this speedy moving guy is? 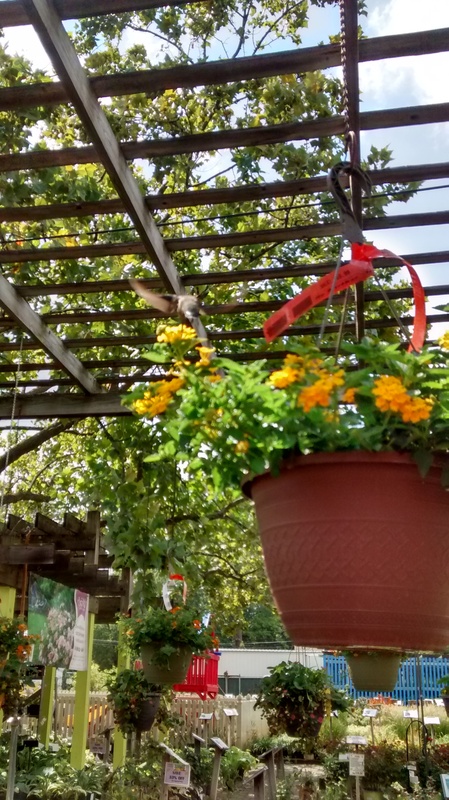 A red throated humming bird! 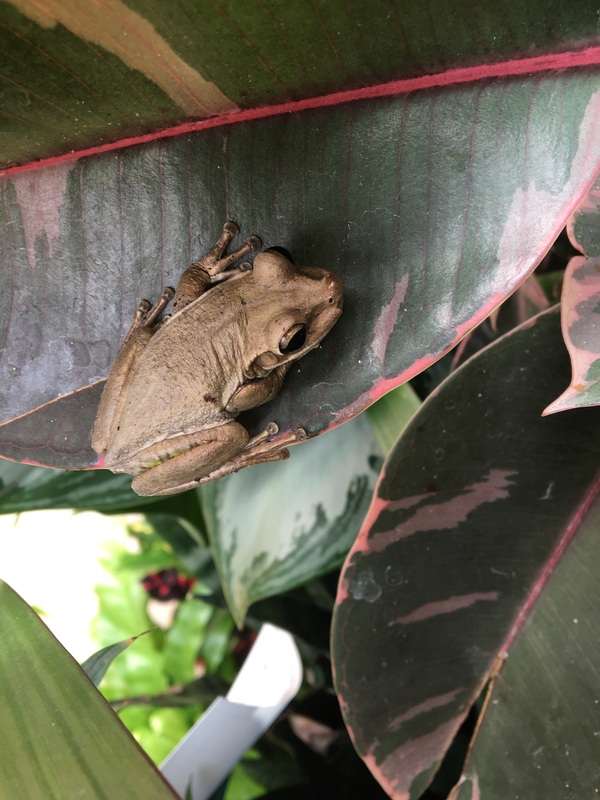 Google tells me this is possibly a wood frog, making a home on some tropical plants. All these friends were photographed in the same day. Special thanks to Lisa, for finding the sweet frog! Black Gum has only recently come across my nerdy plant loving radar. And I’m so glad it has, because it is now in my top 5 favorite trees of all time. And here are five reasons why in a very particular order. 2. 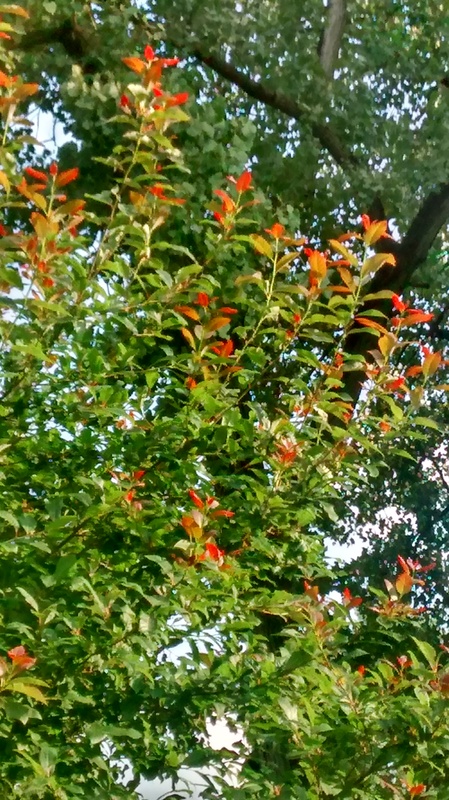 It has amazing fall color. AMAZING!! The straight species has a variety of yellows, oranges and reds. 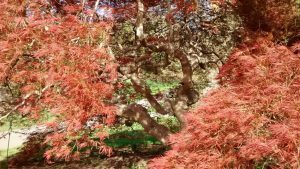 While some cultivars, such as ‘Wildfire’ or ‘Red Rage’ have bright red fall color that would beat the brightness off of any red maple. Yeah, it’s that serious folks. 3. Even when it’s not fall, it’s still has great color. 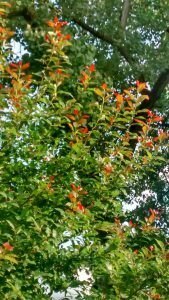 It has oval leaves that are a lovely glossy green. Glossy enough that the shine is noticeable compared to other nearby trees. 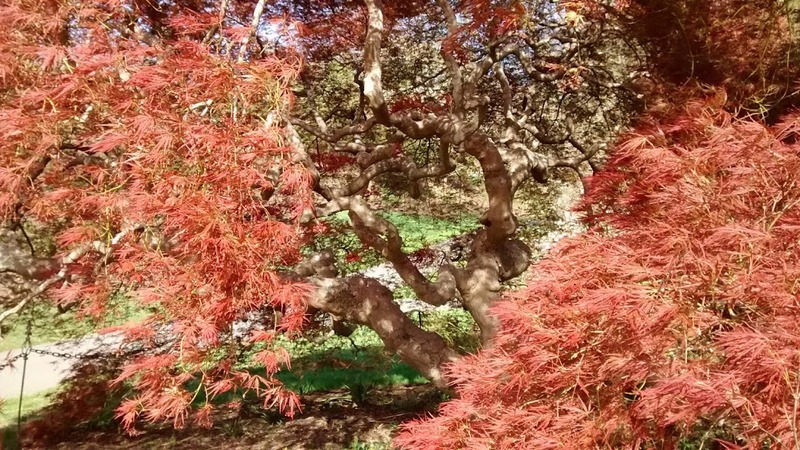 ‘Wildfire’ is particularly striking with its bright orange/red new growth. 5. It’s not a “messy” tree. Any fruit that it bears will be eaten up by the birds – it really never seems to drop any. It doesn’t constantly loose small twigs after strong winds. And since its flower isn’t significant when it’s in bloom, it’s even less noticeable when the flower drops. 6. 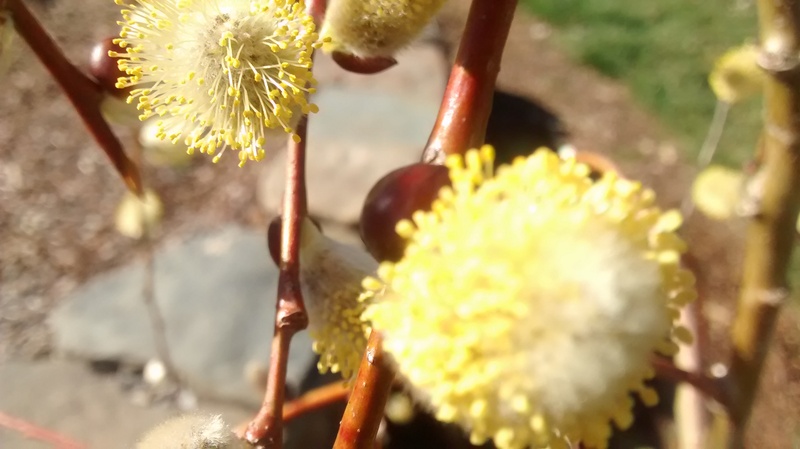 Honey bees love the nectar from Black Gum’s spring flowers! For real, they will go B-A-N-A-N-A-S and you in turn will also go bananas for their delicious honey. I know I said five reasons above, but who could leave out the bees? Given the shape, glossy green leaves and fall color- this is an impressive specimen tree. It will grow to 40’-60’ adding stately to its long list of features. 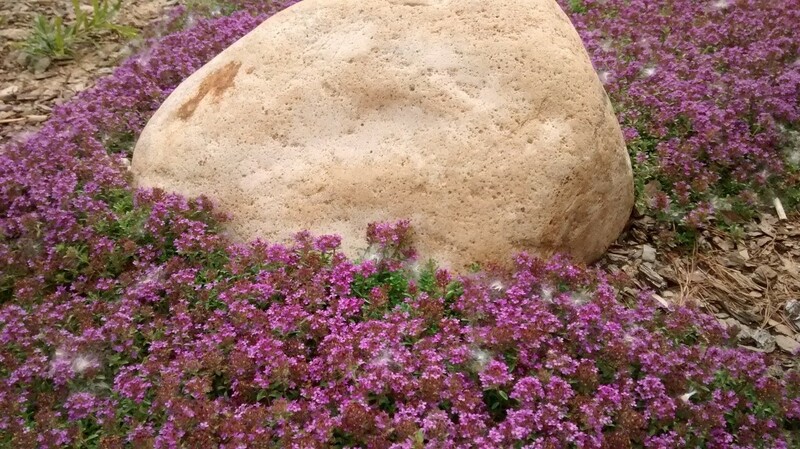 Its tough adaptable and mess free, making it a low maintenance multi-seasonal plant. 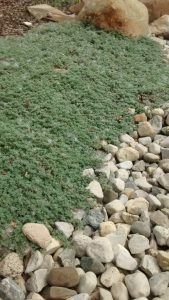 If you have the space, please consider this great under used plant in your landscape. For more information about native trees please check out 5 native flowering trees. The majority also have great fall color. And remember Fall is a great time for planting! We all know that when we put a shovel to the ground here in central Ohio, it can be a bit of a daunting task. We have dense, heavy clay soil which can make digging a hole tiresome, and doesn’t exactly promote healthy plant growth. At Oakland Nursery, we always recommend amending your soil when planting. With what exactly? Anything! Anything that contains organic matter will help break up the density of the clay. Any version of topsoil, compost, or peat will be better than choosing to not amend your soil at all. In many newer housing developments builders backfill around houses with subsoil. 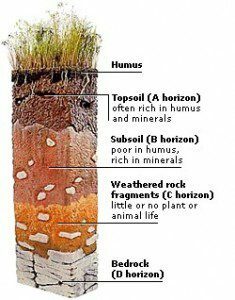 Our soil is typically broken up into multiple layers or horizons. Topsoil, the upper most layer, usually containing leaves and organic matter that’s beginning to breakdown (humus). The next layer in central Ohio is going to be dense clay soil (NE Ohio also has clay soil, but with a more acidic pH. 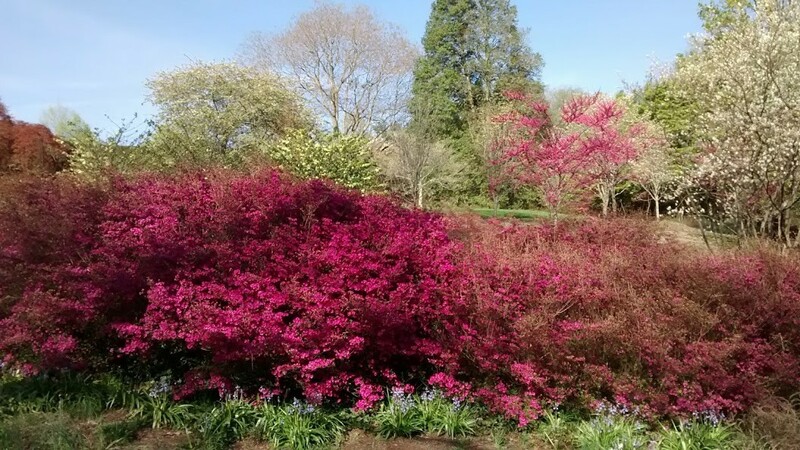 Which is why a certain number of plants thrive better than in our clay alkaline soils – think rhododendrons, azaleas and hydrangeas with blue flowers!) But I digress: it is imperative that you amend your soil. So what is the best amendment? 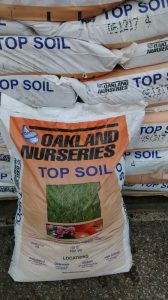 I’ve always considered Topsoil to be the “all purpose” bag – works in most situations and is budget friendly. I’ve reserved my use of costlier compost for perennials and veggies. 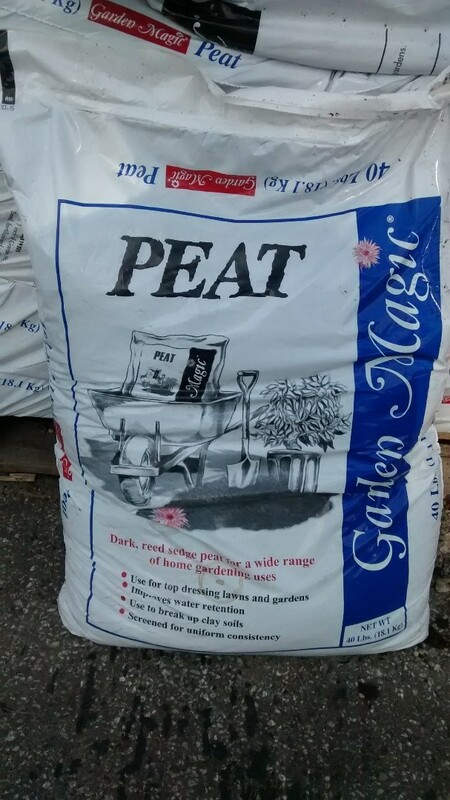 I’ve used peat when I’ve put down grass seed, because it’s the cheapest and a lot of it is needed for seed. Having said all that, I recently did some more research the matter. Research as in: I bothered to read the ingredients on the bag. All the bags. I’m going to share my results with you – with pictures! I couldn’t believe my eyes- no mysterious, un-pronounceable ingredients. Whether topsoil, compost, peat and even potting soil, the main ingredient – the one that takes up 90% of the bag or more – is peat! 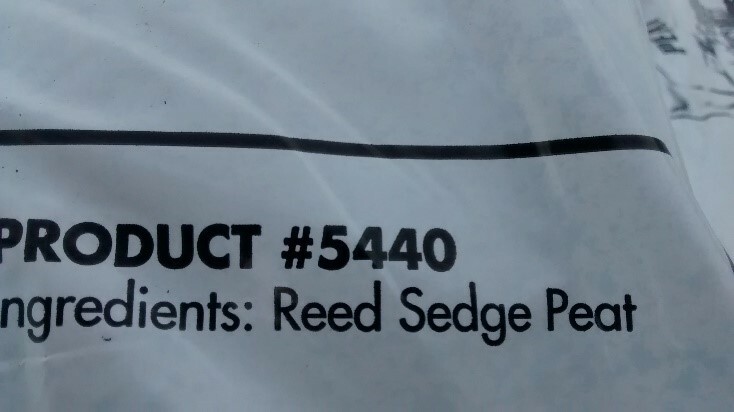 Reed Sedge Peat to be exact. Do hear what I’m telling you?! The scoop is that these soils are all peat based. 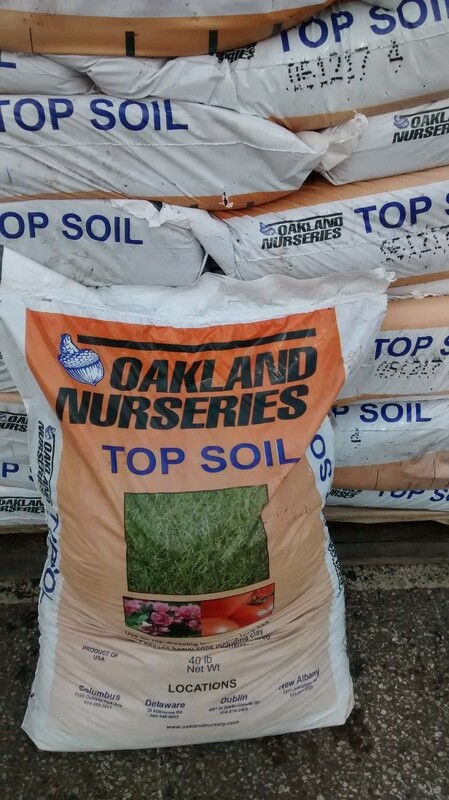 Topsoil (Garden Magic brand) is peat with a bit of sand mixed in. And even though there’s just a small percentage of sand, that sand has value. The sand serves to make the composition lighter and helps with drainage. Something that breaks up our dense clay and promotes healthy plant growth. 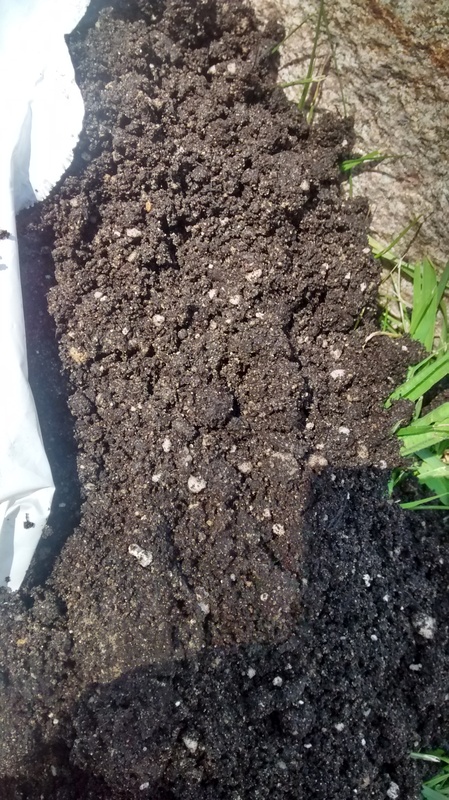 Compost: peat with manure. There are few options offered when it comes to compost. Holy Cow has a higher compost to peat ratio blend than the Oakland Garden Magic, and is priced accordingly. Posey Power is another popular option because it contains horse manure, rather than cow manure. It should be noted that horse manure is considered, um…”hot” due to its high nitrogen content compared to cow manure. 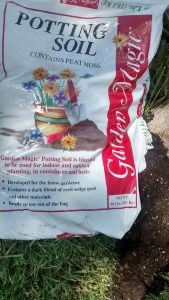 It’s great for leafy greens, garlic, potatoes or corn- but cow manure would be the preferred choice when using it for flowering veggies (tomatoes and peppers) or perennials. 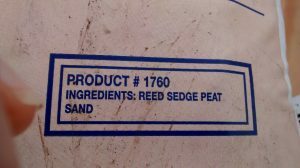 Peat: 100% peat – no bones there. Now, this isn’t ground breaking or negative – I just never realized. Did you know that these products were all peat based? The initial lesson remains the same: amend your soil. Add this peat (with sand, manure, or whatever) because it will help build your soil profile. Some blends contain more soil nutrients than others. Any amendment is better than no amendment. 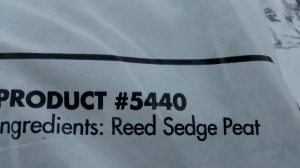 ….But wait….what about Potting Soil? Potting soil is, like topsoils and composts, peat based. The main difference with potting soils is that it contains perlite. Even though there is only a small percentage of perlite, it is important, like sand with topsoil or manure with compost. Perlite will keep air spaces in your soil, preventing it from getting compacted in your container- and compaction means less air and water getting to the roots of your plants.. 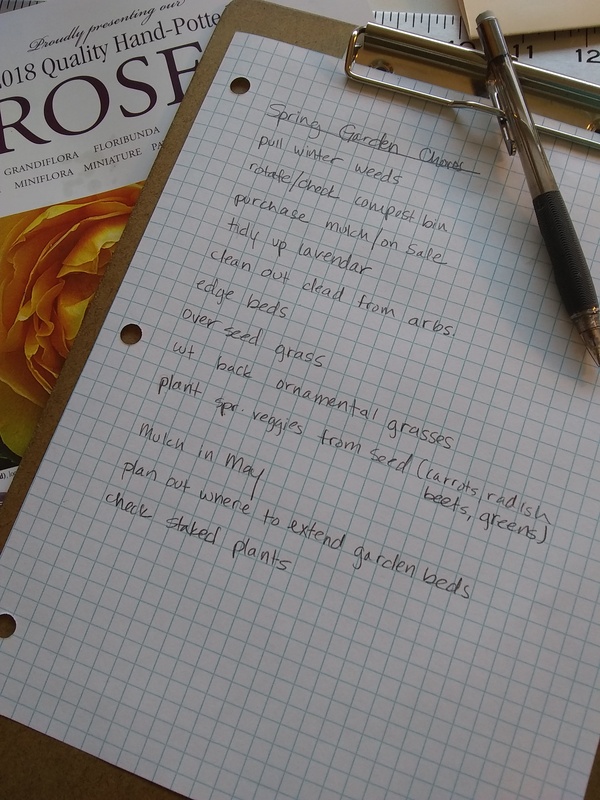 There are so many options (7 is my current estimate) when it comes to potting soil. Promix, Mircale-Gro, Fox Farm and Garden Magic are just the different brands. There are more options then within each brand, a different mixture for any use. Promix has two blends, both containing mycorrhiza, which is a fungus that helps with root absorption. Mircale-Gro also has two blends, which contain different mixtures of fertilizer tailored to their intended use. 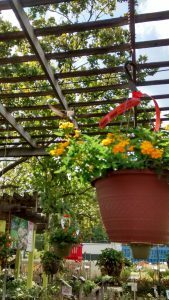 While Fox Farm potting soil blends contain earth worm castings and bat guano. And Garden Magic is the most budget friendly, containing only peat, sand and perlite. 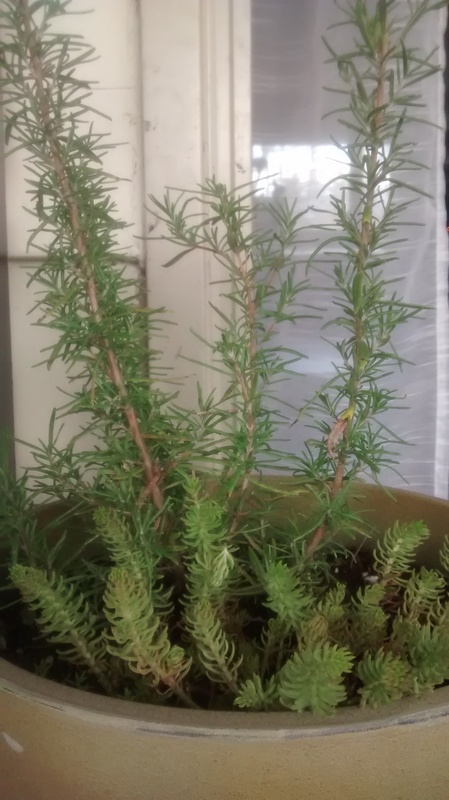 Are there noticeable differences in plant growth using one or the other?….If only I was in middle school again…this is a great science fair project just waiting to be done! Yes! 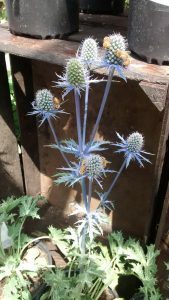 You can have hardy, long bloom-time, even steppable, draught-tolerant perennials… that you can eat! Indeed, many have made even my mediocre home-cooked meals taste decent! We’re talking efficiency here, folks. Not just planting with a purpose, but many purposes. These guys are low maintenance and so, so much more. But I digress: here are some of my favorites that are looking great this summer. We’ll start with the most obvious first – Lavendula. 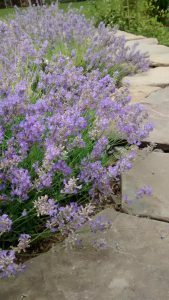 There are many tried and true varieties of Lavender out there – some of which are Provence, Munsted, Hidcote, just to name a few – but there are many more. All are rounded and compact, just some more so than others. I was inspired by The Biltmore’s hedge of lavender in their scented garden within the walled garden. Typically when you think of an herb garden, you just plop down a little bit of everything, right? But a whole hedge of mature lavender? Glorious. Mine is not nearly as mature or as long, but it gets the job done. Its slivery leaves are technically evergreen and, by technically, I mean they can really look rough in late winter. But come April, it’s noticeably perking up. Thyme is another biggie. There many varieties here as well, but let’s just try to get through some of them. 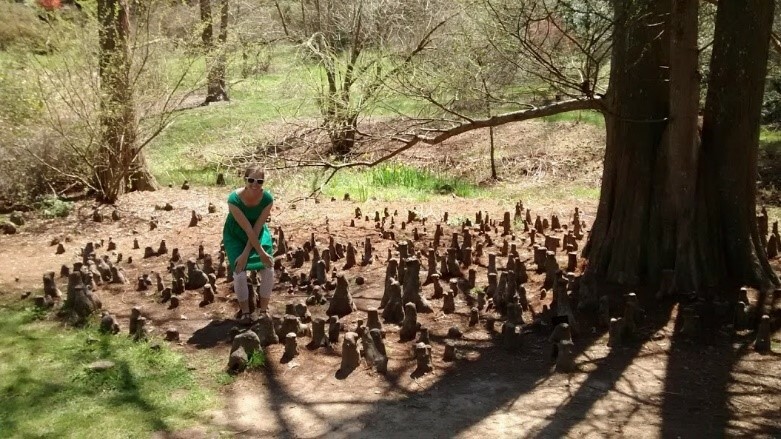 All are steppable – meaning you can step on it and not destroy it. It works nicely bordering a path of a walkway; when you brush past it, it lets off a nice scent. 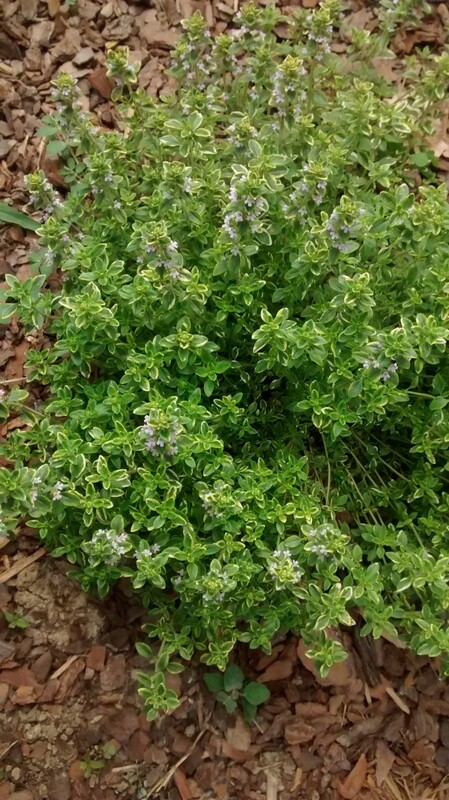 Some varieties, such as English Thyme or Mother of Thyme are edible. Wooly thyme, however, is giving me dry mouth just typing it out. Although it does have a great color a unique texture to it. And man does it fill in gracefully. Magic carpet is another variety which is used more for its long bloom time rather than ingesting, that also happens to be steppable. It also fills in nicely without being aggressive. 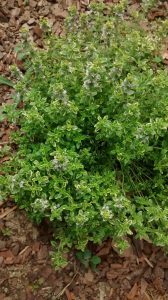 Lemon thyme is probably my favorite of all the thyme varieties. 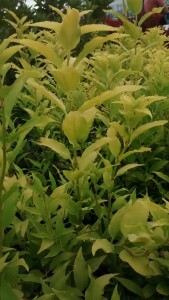 It is steppable, has a great yellow and green variegation and tastes pretty amazing. 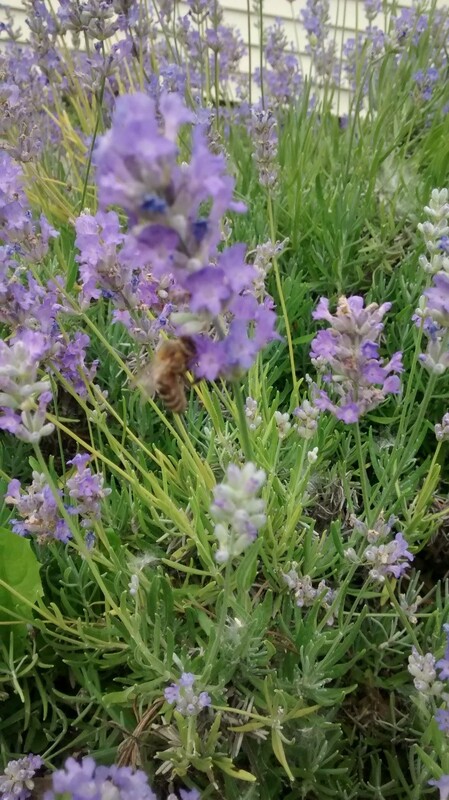 And when it’s in bloom those honey bees seem to really like it. Dill: This guy I didn’t initially have great expectations for. In fact, I would have never planted it in the first place if it wasn’t for one of Oakland Nursery’s interns. 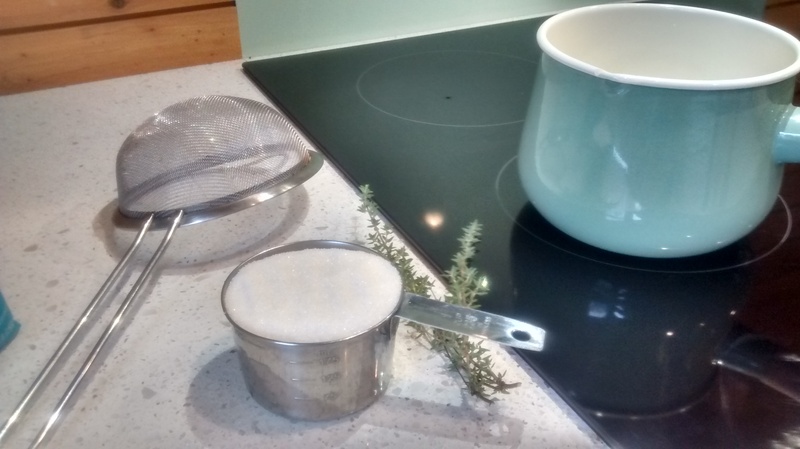 He’s a little obsessed with it, perhaps because it’s the only herb he uses in his limited – but delicious – repertoire. We’re talking only potatoes here. I planted it hoping it would make him feel a little less home sick and I fell in love with this plant. It’s an annual, but it will seed out and pop up in great unexpected places the next year. You don’t even have to brush it as you pass by to get a pleasing whiff. It’s beautiful and will heighten your mashed potatoes to a level you didn’t even know existed. 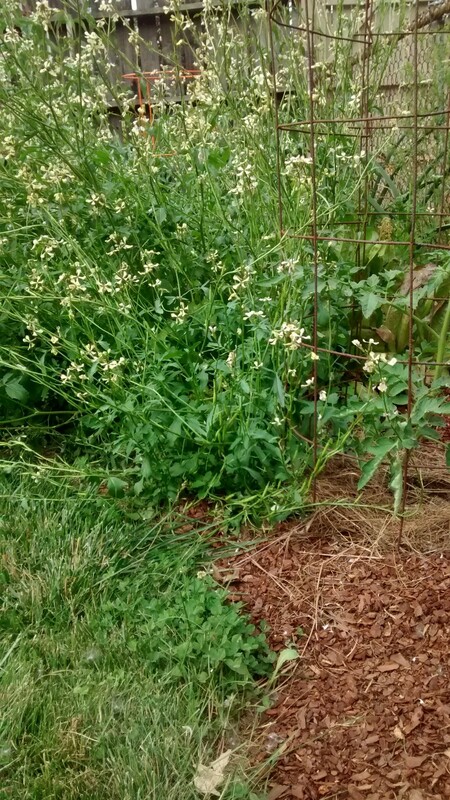 Arugula will bolt (flower and then the leaves will then taste terrible) as soon as our summer weather hits. It’s what we call a cool weather crop. 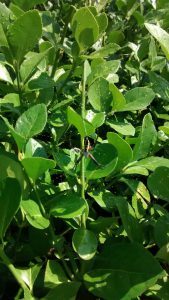 It does best when planted from seed in early spring and again in later summer for fall harvest. 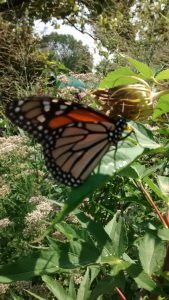 I “let” mine go to seed this summer, hoping it will re-seed itself this fall for me. 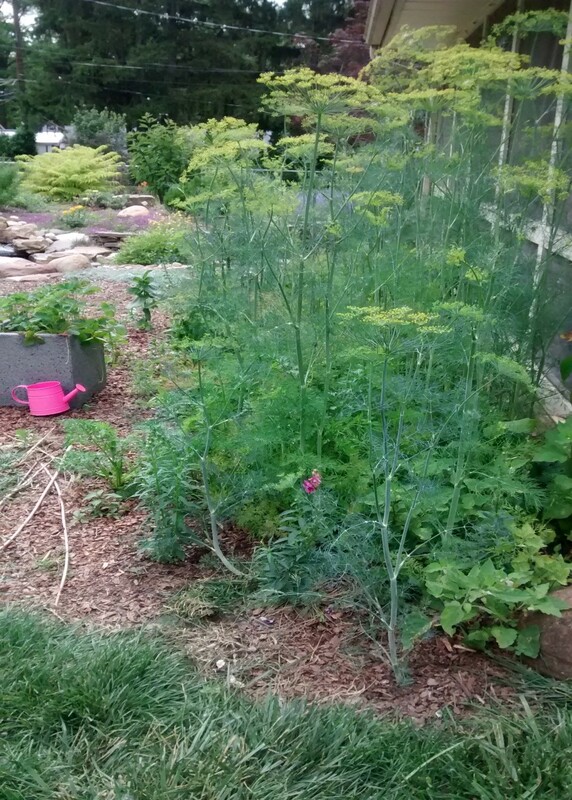 It has a nice white flower to it and fills in nicely, getting taller than I thought it would. It has been able to withstand our recent heat with little rain (I’m not bothering to water it) and the blooms seem to be lasting more than two weeks. So happy to see those honey bees out there modeling for a photo shoot. Happy Gardening! Deutzia gracilis is a small growing shrub (2’-5’ tall and wide), native to Japan, that is tolerant of clay soils – which we know all too well about here in Ohio. 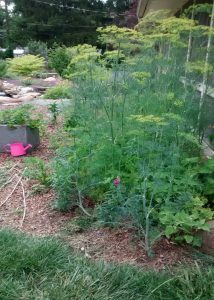 The largest I’ve ever seen it here was about 3 ½’ around in a New Albany garden where they had amended their soil pretty extensively. 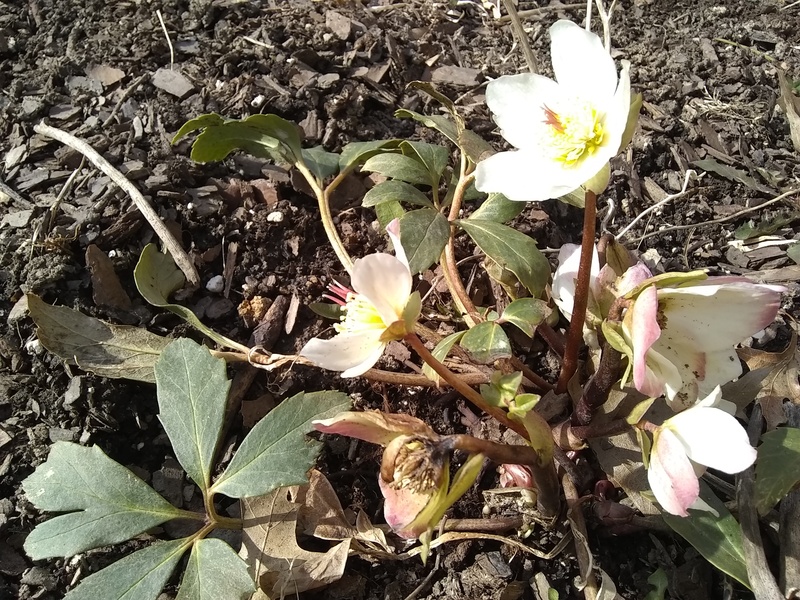 It has a white showy bloom in mid to late spring after it has started to leaf out. The leaves are a bright green and serrated along the edge. It’s often trimmed or made into a hedge after blooming, but I think it has a nice natural rounded shape all on its own. The best part – it can take full sun to part shade! No serious pest (including deer!) or disease problems. 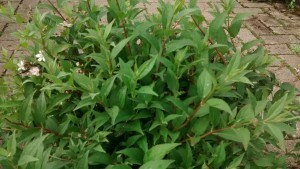 This highly under used shrub also comes in a couple of fun varieties. Deutzia gracilis ‘Duncan’ CHARDONNAY PEARLS is more compact growing to 2’-3’ tall and wide. Also has the white showy bloom in mid to late spring – but instead of bright green leaves, it has showy chartreuse colored leaves. Almost yellow. It too can take full sun to part shade. And no serious pest or disease problems. 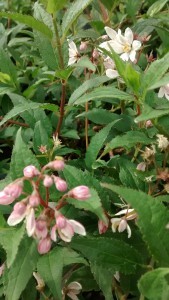 Another variety – seen even less often– is Deutzia ‘NCDX2’ YUKI CHERRY BLOSSOM. It’s even more compact only growing 1’-2’ around. It has a pink showy bloom and bright green leaves. 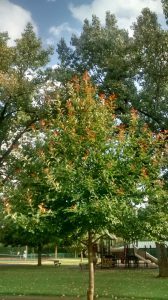 Full sun to part shade and no serious pest or disease problems. At the nursery, we also carry a variety called “NIKKO SLENDER.” It produces lots of tiny, white flowers and is good for small spaces, only getting about 2′ tall. 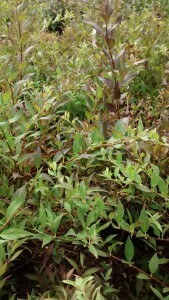 It’s foliage turns burgundy in the fall and can tolerate lots of soils. Other websites claim no fall color, but I’ve witnessed a nice deep purple in late fall before the leaves drop on my mine. Which is cool. As far as uses go: they make a great informal hedge, look well massed in a garden border or could also be used on a woodland border. 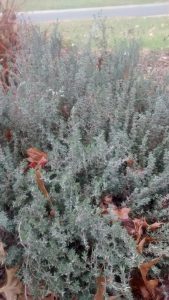 It’s a great three season compact shrub.